It’s February 26, 2016. The ghosts of Robert McCaffrey and Maria Spearman argue before the heavy iron doors of the gallows. Love unrequited and families ruptured. Silence punctuated by the sound of gunfire. A woman half remembered. An unborn child, lost to memory. Throughout, the audience of this necromantic drama fade in and out of time, witness to the pathos of our ethereal hosts and the ritual by which they were summoned. The play is “I Was Here”—a dramatic reading staged by The Cellar Door Project, directed by Mariah Horner, and written by Carleton M.A. student Emily Keyes. Set on the same floor as death row at the old Ottawa jail (now the HI-Ottawa Jail Hostel), it follows two stories, separated by time and circumstance. We are introduced to Maria Spearman, whose relationship with Robert McCaffrey ends in murder over a pregnancy out of wedlock. She is imprisoned for some time in the Carleton County Gaol (now the HI-Ottawa Jail Hostel), the very stage for our séance. But we also meet Keyes, the playwright whose sources beg questions of her from beyond the grave. The actors’ commitment to developing real characters shines throughout the performance. Taking on the story’s central roles, they also embody the various sources Keyes used for her research: a trial transcript, moralizing letters to the editor, not to mention Keyes’ private conversations and reflections. And alongside this performance of historical storytelling they bring to life the many imagined moments that make the story feel real, such as during a conversation with Maria’s jailhouse tormentor who had never shared a block with “a murderess.” Their task is no doubt made easier by the playwright’s skillful narrative, which seamlessly juxtaposes the worlds of the quick and the dead. While Keyes was piecing together a script, Horner was looking for a historian to work with her theatre company. 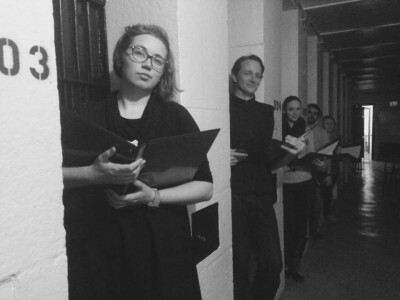 Founded in Kingston, The Cellar Door Project has performed several historical plays, including “Tall Ghosts and Bad Weather,” which drew on historical accounts of Kingston’s Lower Burial Ground, and “On The Run,” an audio tour inspired by Red Ryan’s dramatic escape from the Kingston Penitentiary in the early 1920s. Their performances are almost always set in a real place central to the story. When asked why she focuses on historical subject matter, her answer gives me pause. 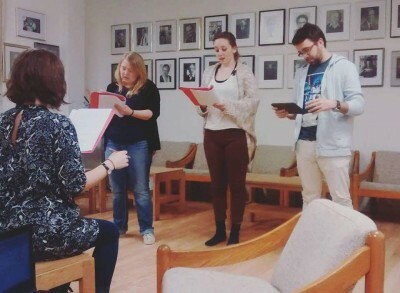 Actors Nicole Bedford, Hayley Berketa and Dean Tardioli (left to right) rehearse before Mariah Horner. One final question demands to be asked. In one of the play’s most powerful scenes, Spearman contemplates the perils of a return home after her shameful ordeal. At the point of tears, she proclaims: “Those people never forget!” The statement is loaded with ambiguous meaning. Is Spearman referring to her family or the people of her community? Is this a comment on the working class, or on the role of gossip in village life? Keyes’ answer addresses both my question and the contemporary relevance of this historical drama. Talking with the people of Goulbourn Township, she realized that the story of Maria Spearman and Robert McCaffrey is still remembered; it occupies a place in the town’s collective memory. And yet despite this, the details are fuzzy: one part rumour, the other conjecture. The statement, then, takes an ironic turn. While the murder of Robert McCaffrey is remembered, those people have, in part, forgotten the details of the case—those key facts that would be the source of Maria’s imagined shame. Her unborn child disappears from the historical record. The village moved on, and along with them Maria Spearman and her family. But remembered anew through the performance, the audience becomes those people. We bear upon our own shoulders Maria’s fears, as well as her hopes. Shall we forget her and let her rest, or remember her fondly, perhaps even affectionately, despite the dark rumours that circle around her family home? 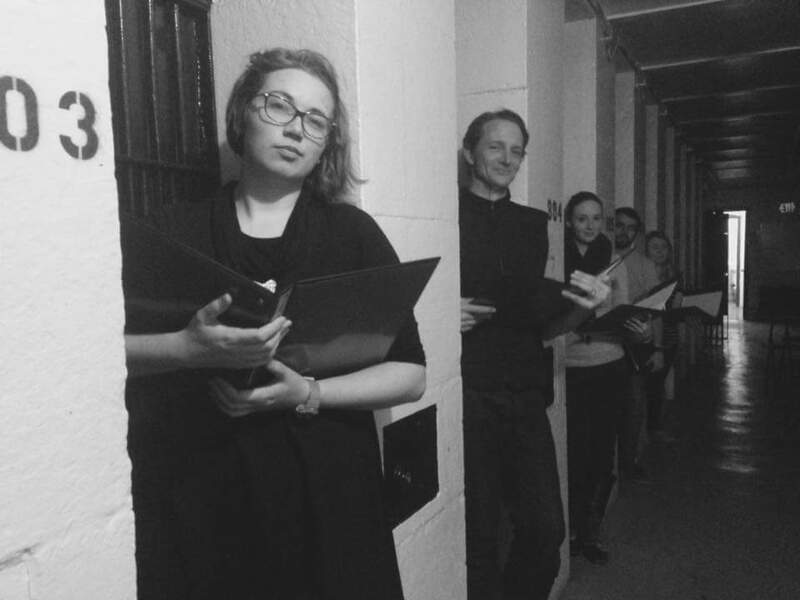 “I Was Here” was performed at the HI-Ottawa Jail Hostel on February 26 and 27, 2016 to three sold out shows. A shame for those who did not get a chance to see it. One hopes for a repeat performance. For another review of “I Was Here,” see Stacey Devlin’s blog post. Post by Shawn Anctil, with thanks to Emily Keyes, Mariah Horner and the play’s cast.